(AUSTIN, Texas – November 20, 2018) If motorists aren’t careful, some of the best deals on Black Friday won’t even be inside the store, they’ll be sitting right out front in the parking lot. Hide your valuables from plain sight. This holiday season is already looking like it could be a cold one, so it may be wise to pack a blanket, which can also provide a great cover for gifts when you aren’t able to get home quickly with your purchases. Another tip that’s often overlooked: keep your cell phone cords and other device accessories out of sight. Burglars are willing to break a window or try a door when they see a cord because there’s a chance that a device will be in the vehicle. Don’t leave sensitive documents in your car. A car burglar may take your sensitive information to commit identity fraud. Instead of keeping this in the glove compartment of your vehicle, keep it in your wallet or purse. Never leave your car running while unattended, even if you’ll only be gone for a minute. Vehicles are commonly stolen at convenience stores, gas stations, ATMs, etc. Many vehicles are also stolen on cold mornings when they are left unattended to warm up. Leaving your key in an unattended motor vehicle is a crime in Texas. many motorists forget to lock their vehicles. 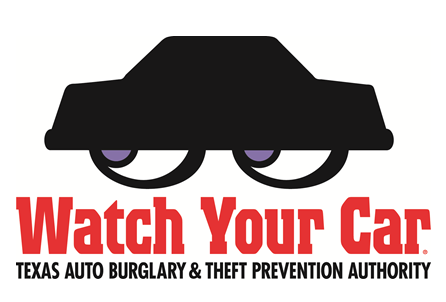 In some areas, investigators report that around half of burglaries and thefts are directly attributed to unlocked vehicles. For more information about how to protect yourself, visit ABTPA online at www.txdmv.gov/about-us/ABTPA.